still in the middle of a couple of games, so here’s another quickie. it’s interesting to me to see what posts on this blog get the most hits, and the main influencing factor is surely the hits from search engines, whose reasonings are as you’d expect completely shrouded in mystery. the statistics provided by wordpress are hardly conclusive, though, as many search engines link to a page of the blog (which isn’t tracked) as opposed to the individual post’s page, but it’s still interesting to see what has risen to the top of the list. 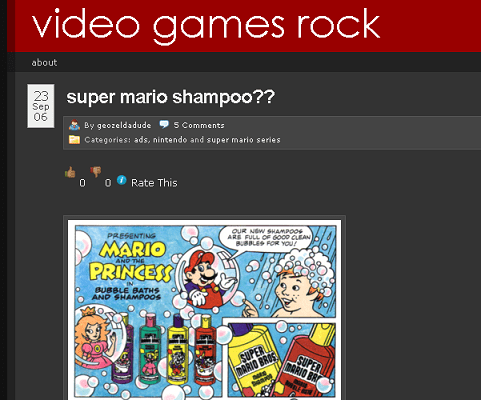 1. way at the top is “super mario shampoo? ?” which is just a funny scan of an ad from a comic from the 90’s. for a month or so this was oddly enough one of the top hits for “funny mario pic” or something like that, which helps explain why it’s the top hit by far. 2. “the sounds of metroid” is pretty high among the rest of the posts. in that post i reviewed the soundtrack of metroid prime and compared it to the darker tone of other entries in the series, although i’m sure the majority of the hits were just due to people looking for mp3s of the soundtrack. 3. “fixing your wiireless” is also high up there. this was just a tip on how to get your wii connected to a comcast router (well, technically a gateway which is a combined modem and router). again this was just due to a stretch of time when people were looking for help on fixing their wireless router in general and somehow my pun-including title ended up high on search engines’ results until their algorithms figured out that it wasn’t helpful to the average person. funny. 4 through 7. the remaining four posts at the top of the list were normal posts that are hopefully actually providing the info that people are searching for. these included reviews and comments on super smash bros. (N64), castlevania 64 (also for N64), E.V.O. search for eden (SNES), and super mario bros.: the lost levels. my guess here is that just not that many people have blogged about those games. the hits for E.V.O. are somewhat surprising since it’s so little known, especially compared to equivalently obscure games that i’ve posted about that have gotten only a handful of hits, such as poor old galactic pinball for virtual boy, but i guess E.V.O.‘s enix pedigree does ensure more attention than the average obscure game.